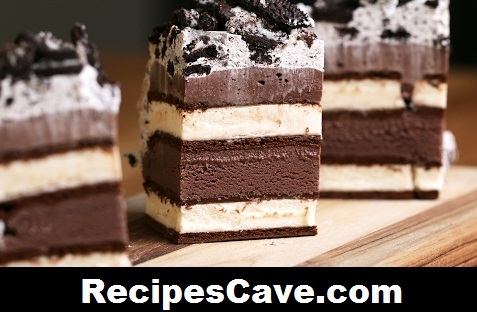 Ice Cream Sandwich Cake Recipe - Here is what you'll need to cook cake and ice cream sandwitch recipe. 1. In an 8x8-inch square baking dish, place a layer of ice cream sandwiches in aluminum foil-covered dish. 2. Top layer of sandwiches with a layer of chocolate ice cream. Add another layer of ice cream sandwiches, and another layer of chocolate ice cream. Freeze for 1 hour. 3. For the icing, combine whipped topping with crushed sandwich cookies until well mixed and cover frozen cake. 4. Garnish with more crushed sandwich cookies and serve immediately or freeze.